This is a simple remedy that works and do you NOT require expensive equipments. I have writen earlier on a lady who uses a hair dryer to relief her arthritic pain in her joints. Whenever you feel that your joints are feeling cold, numb, tired or in pain, a hot water bottle offers a good relief. Else, some people like to keep one in the office (I’ve noticed some people in my office using it as our centralized air condition is too cold!). You can buy a hot water bottle from most pharmacies and take note to get those with a protective thick cloth to prevent burning of the skin. 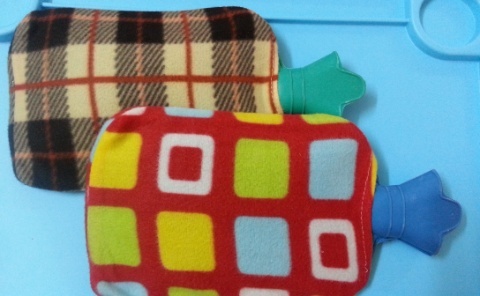 The hot water bottle is usually made from durable rubber that can retain heat for a longer period. Wrapped in a protective cloth and with hot water inside, you can placed them beneath your knees, feet, hip area or on top of your stomach. For lower back relief, don’t lie on it for fear the weight might burst the bottle. Sit with your back leaned against the wall and place the water bottle at your lower back- lean like how you are leaning on a small cushion. The ancient healing said that the central of our energy lies in the dan tian, which between the lower stomach and the lower back. When I placed the hot water bottle at my lower back, I could feel that it warm and activated my digestive and corresponding systems. However, in order for it to be effective you need to use it often, that means you have to boil water till it is hot (but not boiling) and pour into the bottle. Complemented with a proper diet, exercise and supplements, the hot water bottle help you to relief the pain in a much more holistic way. I bought 2 large sized hot water bottles from Apha phamarcy that causes RM11.90 each. 1. 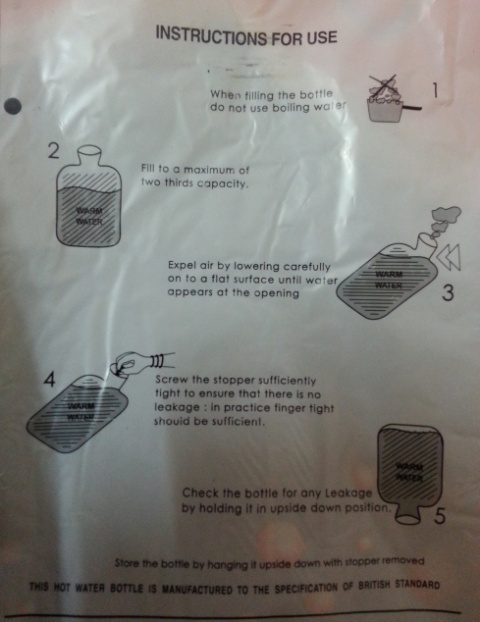 When filling the bottle do not use boiling water. Use hot water. 2. Fill to a maximum of two thirds capacity. Do not fill till it is full. 3. Expect air by lowering carefully to a flat surface until water appears at the opening. 4. Screw the stopper sufficiently tight to ensure that there is no leakage. 5. Check the bottle for any leakage by holding it in an upside down position. After using, store the bottle by hanging it upside down with stopper removed. But do becareful though when you hold so that the hot water would not flow to the area where you are holding. Always secure the bottle with towels before rolling it on your body.